So it’s one thing buying your children fiction or non-fiction. But how about poetry? Have you ever bought your children a poetry book? Recited poetry to them? You definitely have, but you probably don’t know it. When you told your baby a nursery rhyme you were reciting poetry. When you bought them a picture book, you were buying them poetry. I bet The Snail and the Whale would look and most importantly, sound great written out as a poem without the pictures (sorry Axel Scheffler). Poetry has had a bad reputation. It’s often labelled as boring, reflected in our recollections of poring over the Romantic Poets at school and trying to extract meaning in each word, each line. But in today’s age, we should be embracing poetry. Is expressing ourselves in a 140 character tweet that different from expressing an opinion in a haiku? Is a poem of rhyming couplets any different from a rap song? In the same way we disregard rules of grammar and syntax in text messages, poets do the same with poetry. E. E. Cummings didn’t bother with capital letters at all. In fact, by using poetry as a means of expressing emotion, we can let children strip away all the rules and regulations of writing, and concentrate on the pure emotion, expression, opinion and feelings within the language. For children who struggle to read a large amount of text, the jumble and randomness of poetry can be hugely appealing. They can interpret and describe what they see and hear and feel in an artistic way rather like drawing, but using words instead; a mood board of words. This landed on my desk a while ago; a large hardback with full page illustrations and small quiet poems alongside. It exudes a calm even from the cover; the illustrations are unusual for a children’s book – they are portraits of ordinary people doing ordinary things in acrylic paints, realistic and fairly muted in colour, yet they suit the poems in this collection. Each poem depicts an individual making a difference to their community, from the child planting trees in her street and the child clearing rubbish from a communal stream, to the child who helps another at P.E instead of laughing, and the child who befriends a lonely elderly gentleman. 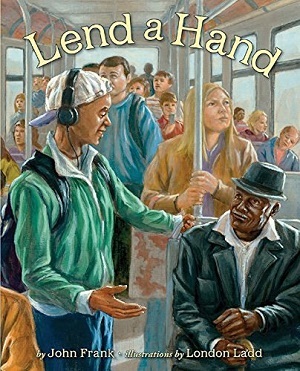 John Frank has not only captured the magic of these small incidental acts of kindness, but also the different points of view. The child collecting rubbish remarks that she didn’t make the mess – perhaps someone else should be tidying it not her – the child who watches the rest of the class nearly fall over with laughter at the ‘klutz’ in PE. I particularly liked the poem called ‘No Charge’, which shows how one good deed deserves another. There are other excellent ideas hidden within the poems – in ‘No Bounds’, the multiplication tables suddenly make sense to a child when she spends time quilting with her grandmother. Although highly American in language and style, I think these poems are particularly plaintive and appeal to a wide audience. The illustrations show a good diversity too. Ages 6+. You can buy a copy here or see the Amazon sidebar. A book which I suppose is what you imagine when you think of a collection of children’s poetry. Silly poems, heartfelt poems, school poems, worry poems, poems about everyday things and about fantastical imaginings. It’s perfect for showing children how poetry can stretch the boundaries of our language and grammar, can mix vocabulary – can use the space on the page to define the poem. These are poems to get lost in. Ones that I particularly like include ‘Me, Myself, and I’, which does rhyme, although not many in the collection do, and points out the importance of self in simple, clear repetitive language. There is much poignancy in ‘The Way He Used to Be’ about watching your sibling grow up and be at a slight distance from you; as well as the very simple ‘Three’ about three best friends. It’s a great little riddle and lesson to learn. My favourite is ‘Lullaby’, which implores the child to pack away their worries, or concerns or frustrations and embrace the night as tomorrow is another day. It’s told beautifully, with wonderful imagery playing with childhood illusions of the ‘cheesy moon’ and preoccupations with homework and fights, but is a grown-up way to approach bedtime thoughts. The whole collection contains silly poems too, but the ones with truisms stand out. One to be treasured and dipped into again and again. 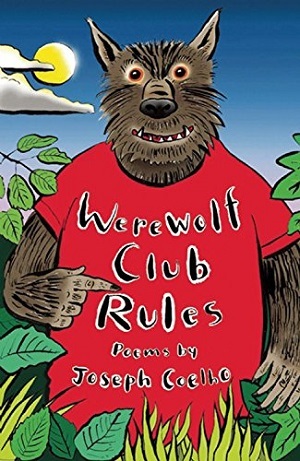 Chrissie Gittins is no stranger to poetry, having been shortlisted for the CLPE Poetry Awards on more than one occasion, and working with the BBC many times.You can buy it here, or on the Amazon sidebar. My favourites were ‘If All the World Were Paper’, which cleverly explores wrapping a baby sister in bubble wrap and smoothing out the creases of a grandfather, and the stunning and unusual imagery of a piece of artwork in ‘Make it bigger, Eileen.’ This has been shortlisted for the CLPE 2015 Poetry Award. You can buy it here, or on the Amazon sidebar. Towards the end of the summer I’ll revisit poetry, as I’ve just been sent the most powerful young teen book I’ve read for a while – and it’s all in verse. I can’t wait to tell you about it. In the meantime, you can see that from the very young to teen, poetry is a great way into story and narrative.